I just added this image (below) to a page on this site. This is true. Basically what happens at networking functions is people push their business card onto you and try and sell you stuff. It’s not the way to do it. I have this image in my head that you can almost smell the desperation at networking functions. I’ve brushed off any invites to stuff liek this so have luckily avoided experiencing it first hand. Can’t think of much worse an event to have to attend. Just so contrived. 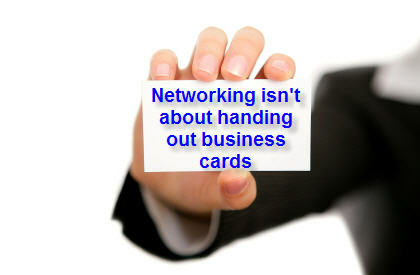 Have you come across BNI (Business network international) before? Networking is pretty easy – it’s simply about meeting likeminded people in the right situation to start creating a relationship. The overwhelming thing…….you know what, I’ll write a blog post about this.